Amazon SES announced about the support for the SMTP interface. Now you can use the Amazon SES SMTP server in your existing email sending systems, including G-Lock EasyMail and WPNewsman plugin for WordPress. 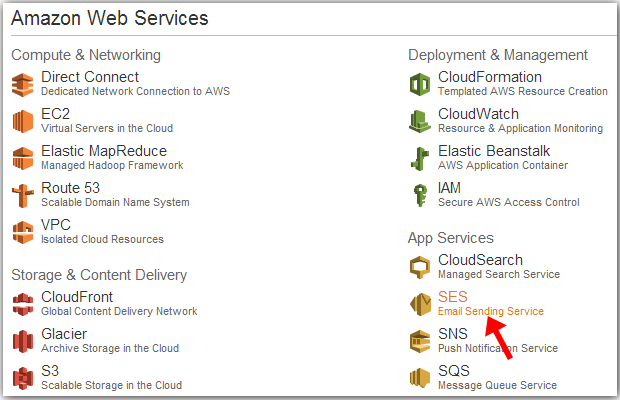 As before, you can continue sending emails using the Amazon SES API as described in this tutorial. You can choose yourself which method works best for you. From this article you'll learn how to integrate G-Lock EasyMail with the Amazon SES SMTP interface. Important! Your SMTP credentials are not the same things as your access key and secret key! 1. Go to AWS Management Console. 2. Click on "Sign in to the AWS Console". 3. Click on "SES Email Sending Service". 4. Click on "SMTP Settings" at the left side. 5. Click on "Create My SMTP Credentials". 6. Enter your SMTP user name [this user name will be used to identify you in the Amazon AWS panel only]. 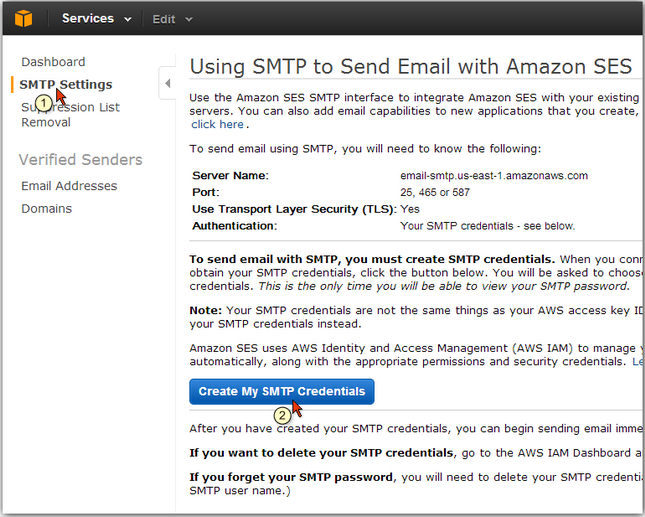 After you created your SMTP credentials, you can configure G-Lock EasyMail to send emails through the Amazon SES SMTP interface. Click on the Accounts menu and then click on "Add New Account". Important! The "E-mail Address" and "Return E-mail Address" must be verified with Amazon SES. *Though on their website Amazon SES says to use the "Use Transport Layer Security (TLS)" connection, in G-Lock EasyMail you need to select the SSL connection option. After you enter the SMTP settings, click Test to test your account. If the test passes, click OK to save the account settings. Before you send the email, open G-Lock EasyMail Delivery Monitor and enter the number of Threads according to your Amazon SES quota per second. You can get your quota either in your account on Amazon SES or in G-Lock EasyMail. In G-Lock EasyMail open your account settings where you use the Amazon SES API and click on "Get Quota Info". Note the value in the "Max Send Rate". For us it is 14.0 which means we can send 14 messages within 1 second. You may see a different value depending on your quota. 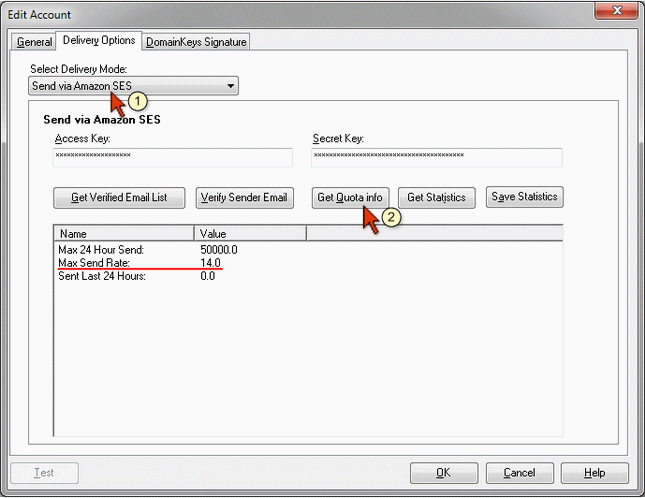 After you enter the number of Threads in the Delivery Monitor, create the email, select your account with the Amazon SES SMTP credentials and click Send.